2011 has certainly been the year of the sock. It began with the Super Special Six Personal Sock Club, though by the forth pair I’d strayed into wildcard territory and was loosely following the pattern for the next couple of months, progressively straying from the plan. By October it was clear most of the family I give gifts to at this time of year were getting socks. 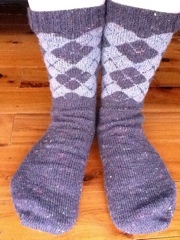 Toe up Argyle socks in XXL Trekking grey tweeds for dear husband. 2mm on foot and 2.5mm needles on leg. These are my first attempt at argyle fair isle stranding technique and a big lesson in loosening my knitting style (knitting inside out helped). Even though neither of them fit him first go, he was gracious enough to love them anyway and I have high hopes for blocking the tweed out of them! Next up the pair of Nancy Bush patterns that I knit for my parents, dad’s Spey Valley on the left in XXL Trekking blue tweed, same needle combo as above. Mum’s are on the right in a new favorite sock yarn, Louet Merino gems in Terra Cotta and the Fox Faces pattern, knit in 2.5mm needles through out. All components made for each other. I’m not sure what was more fun, completing these or the ‘photo shoot’ involving mum and dad playing up like a pair of kids having their school photo taken, complete with “she’s touching my knees” and “his feet aren’t even”. I visited my sister and her family earlier this month and given the weather in the tropics I decided a knitted stocking for my nephew Jakob was the most appropriate. By this time I’d caught the colour work bug and started to teach myself knitting continental style so I could knit a little faster and more evenly with a colour in each hand. Another Nancy Bush pattern – Christmas in Talin and I used 3.25mm needles and a mix of 8 ply yarns including a lovely soft Woolganics chili red and spring green. 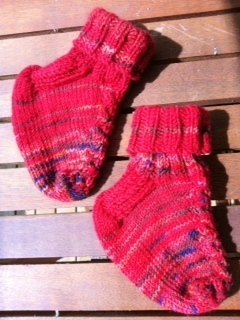 For my youngest nephew Milan I made these very cute Wiggle Toe socks, using a Cat Bordhi pattern and a couple of different sock yarns I had left over from other larger pairs. What next? 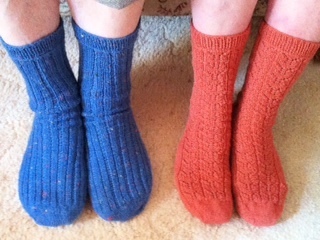 There is a substantial queue for 2012 beginning with Anniversary Socks, yes another Nancy Bush pattern. More about them next year. However you’re celebrating this time of year I hope it was pleasant, relaxing and full of joy! I especially like your parents photo!! Love to have seen the look on their faces as well!!! Thanks Fee. I was so focused on their feet I forgot to photograph their faces! 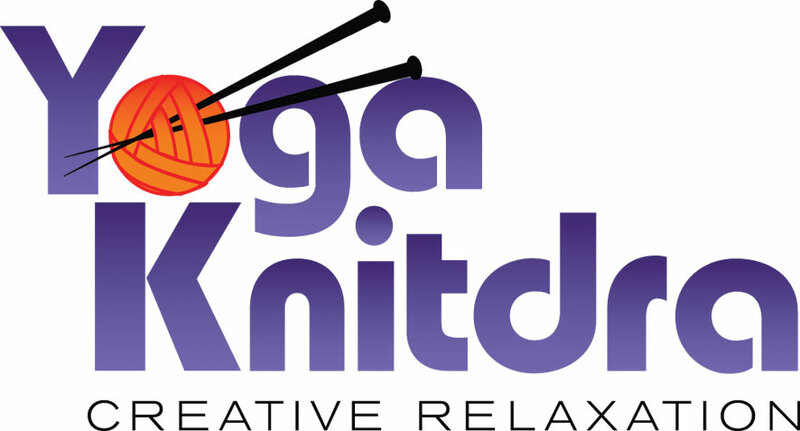 I did Sock Knitters Anonymous for a year- 11 pairs in 12 months. 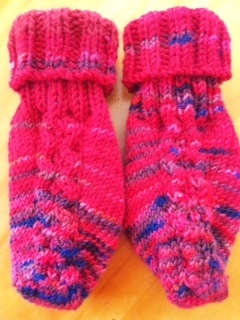 I haven’t knit socks since…. but I’m getting the itch to do it again. Yours are great! I especially love the argyle ones. Heh, I agree with Fee, that would have been funny to see! Good work on the socks! I do love the argyle ones especially. so many gorgeous patterns, such beautiful socks. I can’t believe you finished all these so quickly. 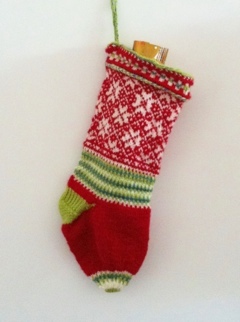 I’m looking forward to our various sock KALs this coming year, including lots of What would Nancy do questions!